During pregnancy, women are extra careful, diligent and alert about everything they do, right from their health to their diet. Not just the mother, even friends, and close relatives become cautious. This is why as soon as you give the “GOOD NEWS” to your close relatives and friends, they start showering you with well-meaning advice. But one thing you may not hear much about is the need to drink the right amount of water every day. An essential element of life, water constitutes more than 50 percent of a person’s body weight, making it the most common element in the body. Adequate water intake helps keep you hydrated, detoxified, and energized. Drinking more fluids also helps reduce water retention in the body. And without a doubt, it helps ensure the proper health and growth of your unborn baby. A 2002 study published in the Journal of Perinatal Education reports that general fluid needs increase during pregnancy in order to support fetal circulation, amniotic fluid, and a higher blood volume. Hence, water is an important nutrient for expectant mothers and their infants (1). Drinking normal water is very beneficial, and warm water is even better. In fact, experts believe that drinking lukewarm water during pregnancy is good for your health as well as your unborn baby. Here are some reasons why you should drink warm water during pregnancy. Beginning the day with a glass of lukewarm water helps soothe and activate the digestive tract. 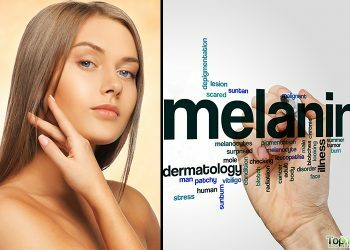 It helps the body flush out all the toxins that have built up overnight. 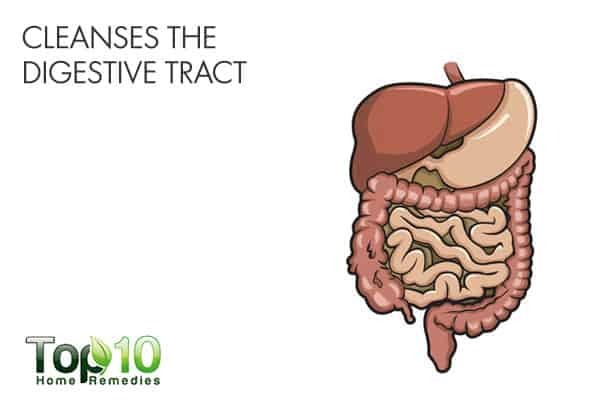 An accumulation of excess toxins in the body often gives rise to digestive problems. Warm water also tends to break and melt down the fat and oil deposits in the body that can otherwise lead to digestive problems. On the other hand, drinking cold water during or after a meal can lead to fat deposits in the intestines. 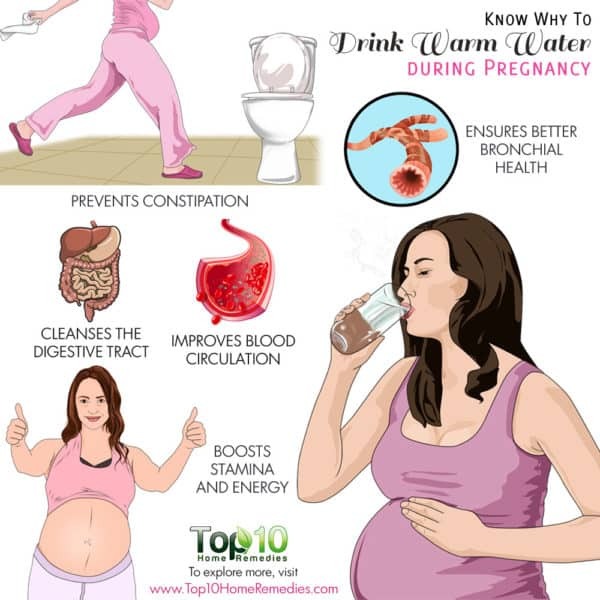 So, drinking warm water makes the digestive tract clean and clear, and gives way to better nutrition for the baby in the womb. 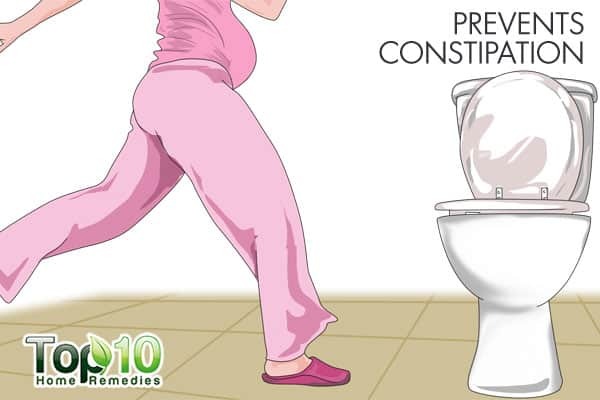 Constipation, one of the common pregnancy-related discomforts, can also be prevented by drinking lukewarm water. 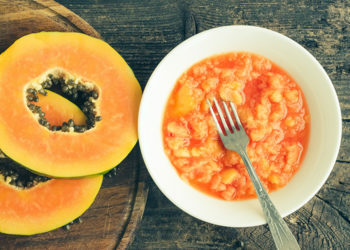 Constipation means you have little to no bowel movement, and you need to put a lot of strain into the elimination process. 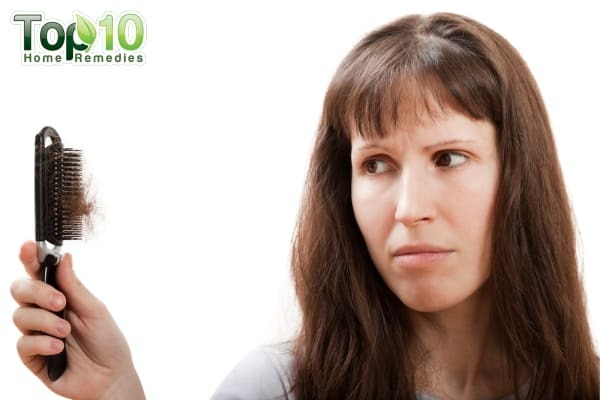 Constipation is mainly due to a lack of water in the body. Drinking a glass or two of warm water in the morning on an empty stomach can help improve bowel movements. Warm water will help break down foods to help them smoothly pass through the intestines. Stimulating the bowels will help provide relief from constipation and acidity. Drinking warm water also improves blood flow in your body. Warm water works as a vasodilator, which means it expands the blood vessels, thus improving circulation throughout the body. 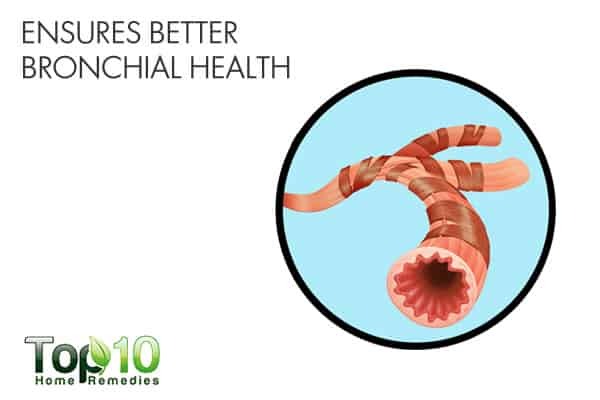 Better circulation ensures better flow of oxygen and nutrient-rich blood to the muscles and organs – and also to your unborn baby. 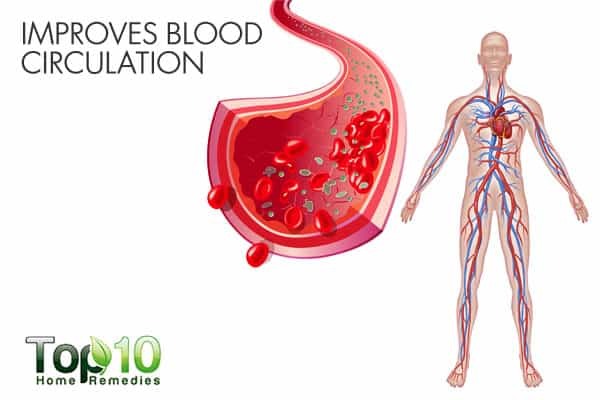 In addition, improved blood circulation is beneficial for the immune system to help defend against illnesses and diseases. 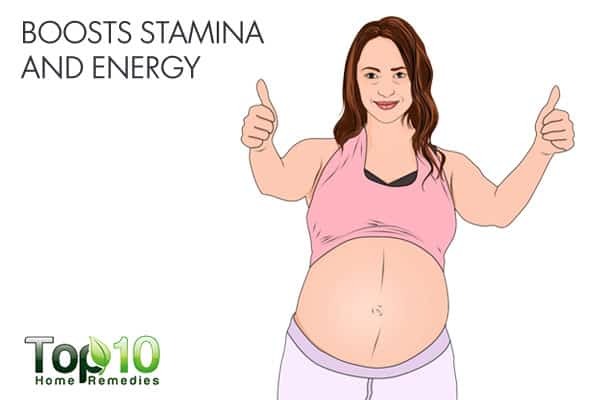 Fatigue and tiredness are common during pregnancy, due to the hormonal changes as well as body changes that take place as the pregnancy progresses. But by drinking warm water from time to time, you can boost your stamina and energy level. Warm water flushes out toxins that are circulating throughout the body and enhances blood circulation. This is important for proper muscle and nerve activity. Also, water intake helps prevent dehydration and adrenal fatigue. A glass of warm water daily, especially with a small quantity of lemon in it, will help boost your stamina and energy levels so you can beat pregnancy fatigue. Getting ill during pregnancy is not good for you or your unborn baby. Drinking warm water ensures good bronchial health, as it reduces the chances of throat infections, colds, coughs and the flu. The warmth of hot water creates steam. So, when you hold a cup of hot water, it helps loosen clogged sinuses and even soothes a sore throat caused by mucus buildup. It also helps clear nasal congestion. 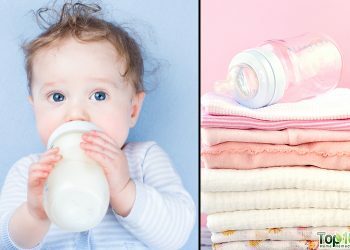 During pregnancy, it is very important to avoid any kind of infections that will require medicine, which in turn might cause problems for the fetus. You must drink 8 to 10 glasses of water every day to ensure proper hydration and healthy functioning of the body. Excessive intake of warm water is not necessary, just 2 to 3 cups daily are required to reap the benefits. Your drinking water should be tepid or lukewarm, not scalding hot. Avoid tap water, as it may contain lead and high mineral content that can cause serious damage to you and your unborn baby. Always drink filtered or boiled water to eliminate the risk of becoming ill. The water requirement may increase according to the weather conditions and your daily activities. After taking a walk or any other light exercise, drink some water to compensate for the body fluid lost during the workout. 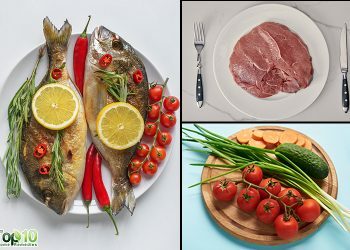 Apart from water, you can also include fruits and vegetables with high water content in your diet. Fresh fruit juice, vegetable juice, homemade broth, and soup can also help a lot in keeping the body hydrated. When going out, carry a bottle of water with you. Montgomery KS. Nutrition Column An Update on Water Needs during Pregnancy and Beyond. The Journal of Perinatal Education. https://www.ncbi.nlm.nih.gov/pmc/articles/PMC1595116/. Published 2002. Accessed February 24, 2018.